Hi! 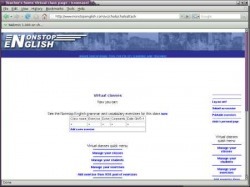 After two weeks looking for a way to have virtual classes in my site, yesterday I decided to create a virtual class at http://www.nonstopenglish.com/ .The name of the first class is obviously "Chalsattack". That name may not be too serious but it is fun. Well I think that the service they provide at that site is excellent. At least what I've tried so far. I have known and used the site to do activities online for years but to tell you the truth I did not know that they provided this virtual classes thing until I started to really look for it. Oops! after so many hours searching the net just to go back right where I started from. Well, these things happen!!! Now I must write the 'how to' on my site as clear as possible so that everybody can understand the instructions. But in short it is very easy. Students can do interactive exercises on the site without registration or alternatively they can register and provide my e-mail address so that they are forwarded to me and thus I can assign them to a class with a specific level of English, I can give them homework and follow their progress online. Again: it's amazing. Maybe in time I start building a site like that since I have all the necessary things (Web server, hosting service, domain and debian software) except time to do it. It's one of the options that I had in mind in the beginning. I had also considered writing some interactive quizzes to post in my site. This option is still in mind. But in the meantime let's focus on what we've got and enjoy it and learn from it!! !